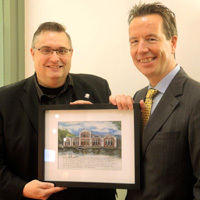 Webster University alumnus Dave Mead, who graduated from the Leiden campus in 1994 with a BA in Strategic Marketing Management and Media Communication, has used the combined perspectives of American and Dutch education in his work for two companies and with charities. The leader of the Webster University Alumni Association the Netherlands is stepping down after nine years of service to create more time for his volunteer work. The proud alum recently sat down for an alumni spotlight, sharing reflections from his career and how Webster has made an impact. "When I came back to the Netherlands [after his family moved to New Jersey], I tried to transfer my credits, which worked perfectly well with Webster University," Mead recalled. "I was very interested in what kind of marketing teacher I would get, and then Randy Bootland came along. He is very talented. He really pushed me to get the most out of myself and inspired me to set up my own company." Asked about his experience in marketing education on both sides of the Atlantic, Mead said, "I think that American marketing education is very different from Dutch marketing. In the Netherlands it’s mostly based on research and facts, while in America it’s more geared towards psychology. I got the American experience from Webster, and I also got the traditional Dutch marketing education from a different institution. It was very interesting to see the different approaches to marketing." As he prepares to devote even more time to his volunteer and foundation work, Mead reflected on the connections and values he experienced at Webster as a student and alum. "I think it’s important that people give back to society. Everyone will always get something in return," he said. "That’s one of the things that I like about my position at Webster: I have a great international network. At the international alumni leadership conference you meet so many people with different positions from across the globe; it’s extremely diverse. It’s great to get in contact with other chapter leaders worldwide to discuss our best practices. I have made many really good friendships out of this. Webster has managed to grow big by staying small. Numerous locations all over the world, but with a focus on small, personal, quality education. I don’t think most graduates realize the enormous capacity surrounding Webster." Read the full profile from Webster University the Netherlands.